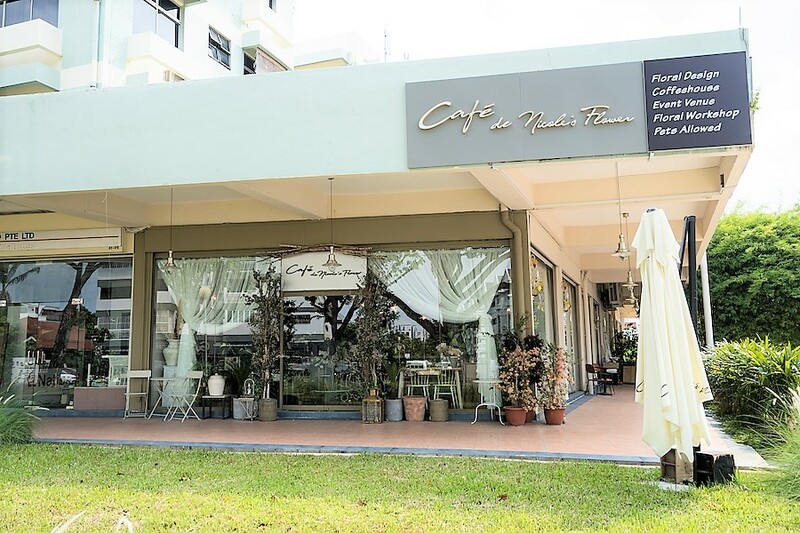 Cafe De Nicole’s Flower at Telok Kurau is one cafe quite unlike others I have been to in Singapore. 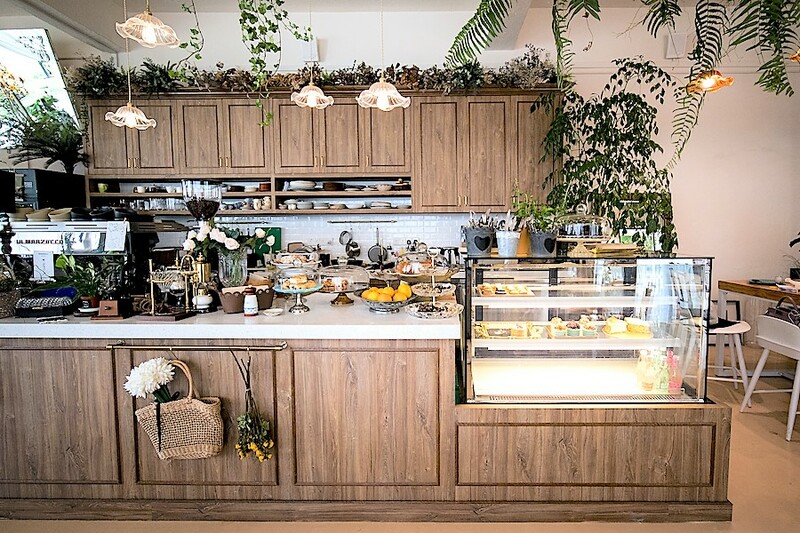 While many new cafes in Singapore has gone for a minimalist or industrial concept, Cafe De Nicole’s Flower focuses on a garden theme. And this is not just about the aesthetical aspect but also through its presentation and scent. 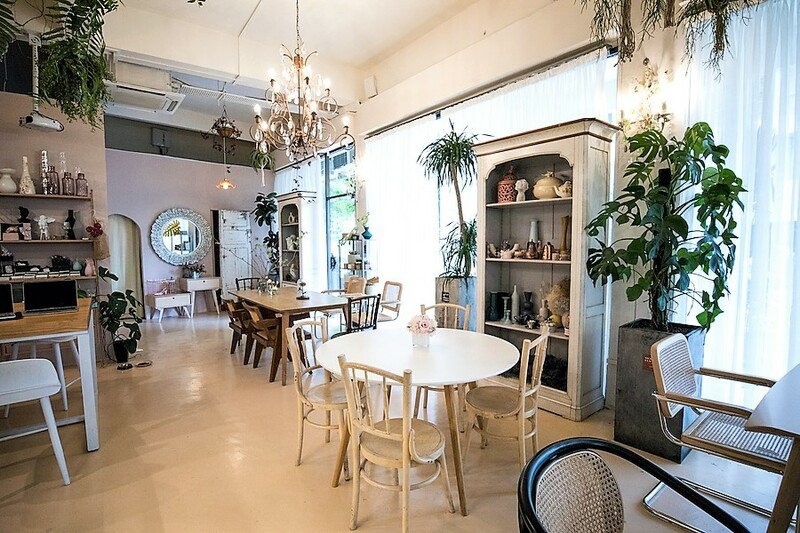 There are multiple Instagram-worthy corners in this spacious 45-seaters cafe: the florist corner at the entrance of the shop, followed by the study room, kitchen, living room and finally the dining room. 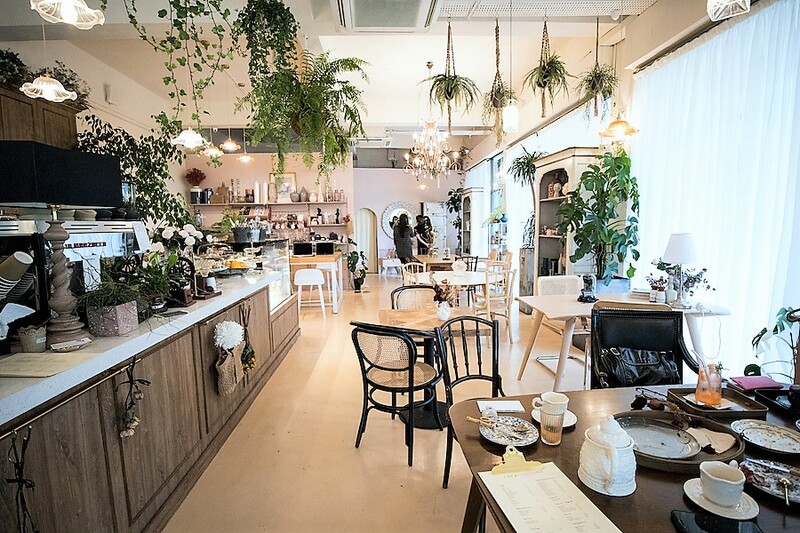 The cafe probably can serve as a backdrop for some Instagram “fashion shoot”, magazine spreads or dating shows – IF it is unoccupied. 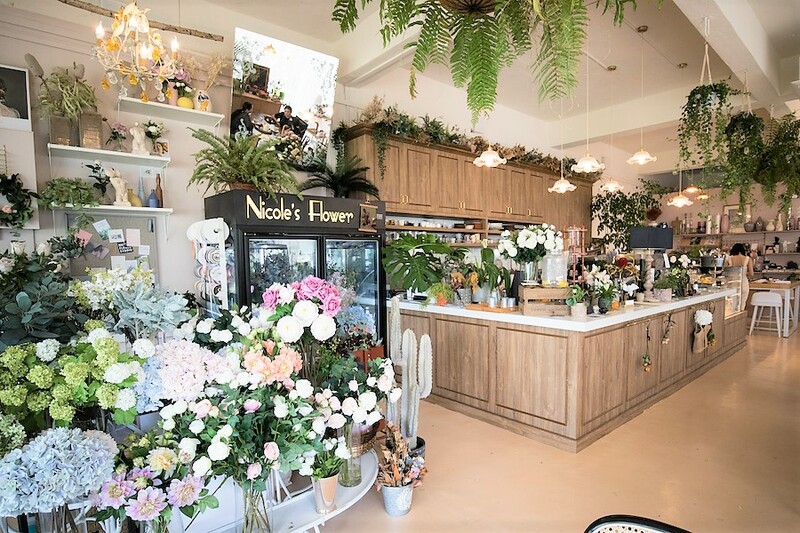 Being a florist shop, an event space, a workshop venue and an animal playground (yes, it’s pets friendly too! ), the interior is like a garden with its pleasing floral scent in almost every part of the space. 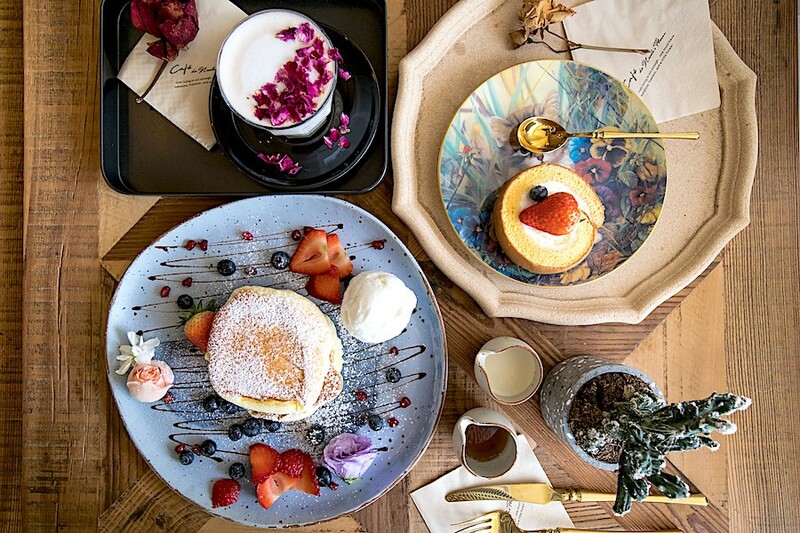 A comprehensive 3 pages menu includes all-day Brunch ($8.90 – $21.90), Salad ($11.90 – $14.90), Waffle ($9.90 – $15.90), Souffle Pancakes ($15.90 – $19.90), Acai Bowl ($9.80/15.90), Ice Cream ($5.30/5.80), Cafe de Nicole’s Flower Specialty ($7.90 – $9.80), Flower Tea ($7.80 – $9.80) and Coffee ($3.80 – $9.90). 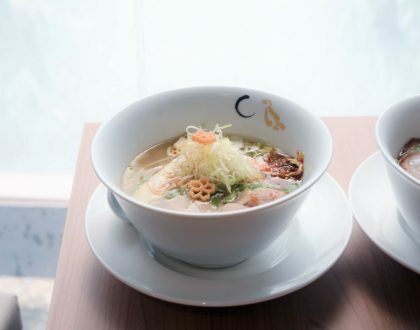 Additional 10% service charge applies. Something that caught my attention is the addition of flowers, be it dried or fresh flowers, in all the desserts and drinks that I ordered. 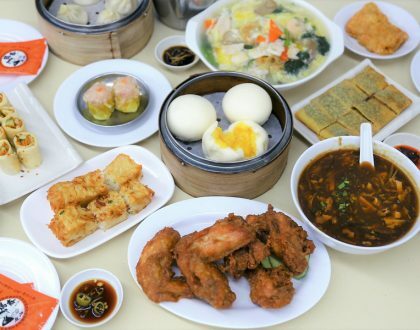 The flowers are meant for diners to takeaway after the meal. So guys, bring your ladies here on a date, and surprise her with another stalk (or bouquet) of flowers. 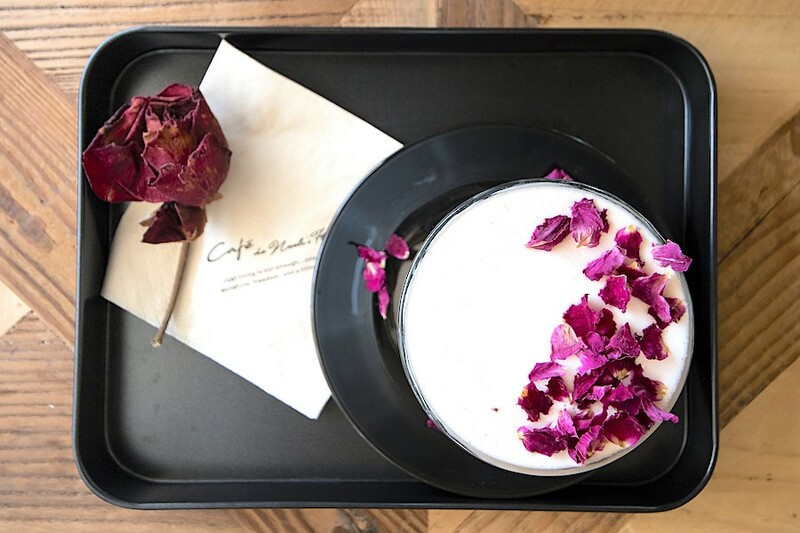 The Rose Latte ($7.90) is one of the prettiest renditions I have seen in Singapore so far, generously sprinkled with bright purple rose petals with a separate dried rose on the tray. This drink definitely caught the attention of the ladies sitting at the next table, and they each ended up with a cup of Rose Latte (well… possibly more to take selfie shots than to drink). 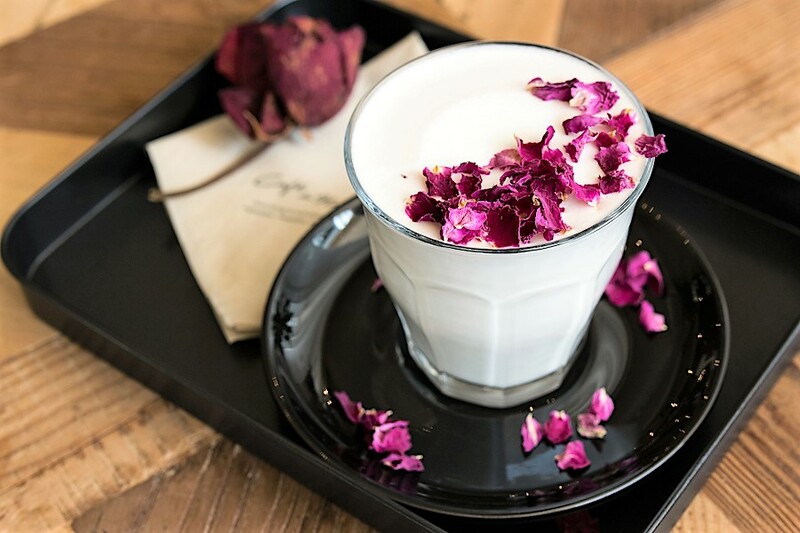 Unlike most other rose lattes in the market, the scent of roses reached my nose before drinking it, stimulating my sense of smell for a more complete experience. While the drink may not be too strong or tasted Bandung-like, the smell of roses definitely makes it more unique. 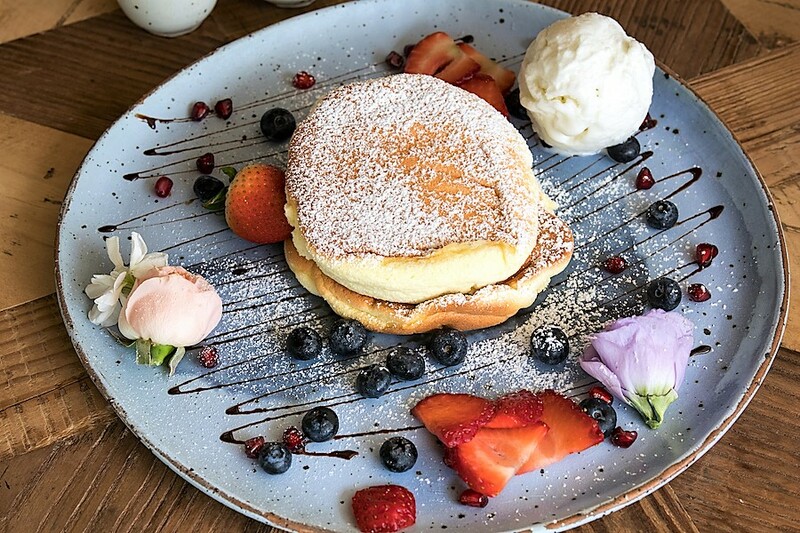 Soufflé Pancakes are also available here, available in three different flavours: Original ($15.90 – $19.90 depending on toppings), Matcha ($18.90) and Tiramisu ($18.90). 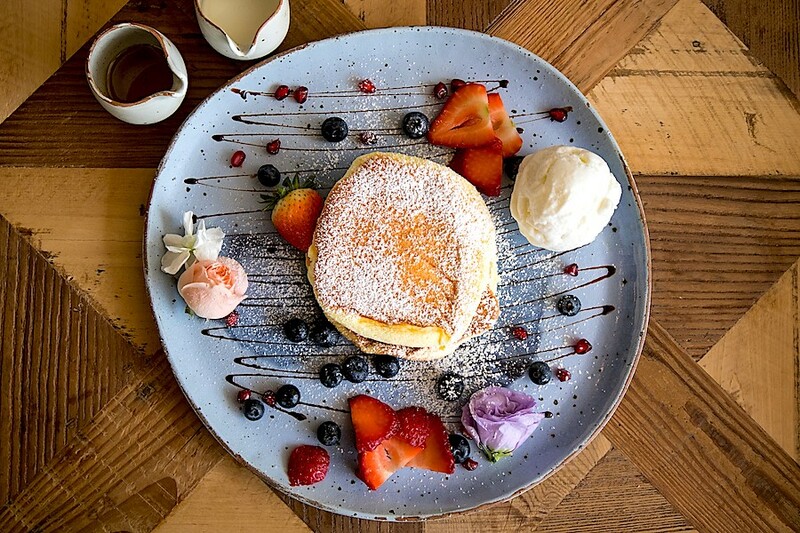 The Original Soufflé Pancakes ($19.90) comes with butter, syrup, cream, mixed berries (strawberry, blueberry, cranberry) and a scoop of coconut ice cream. 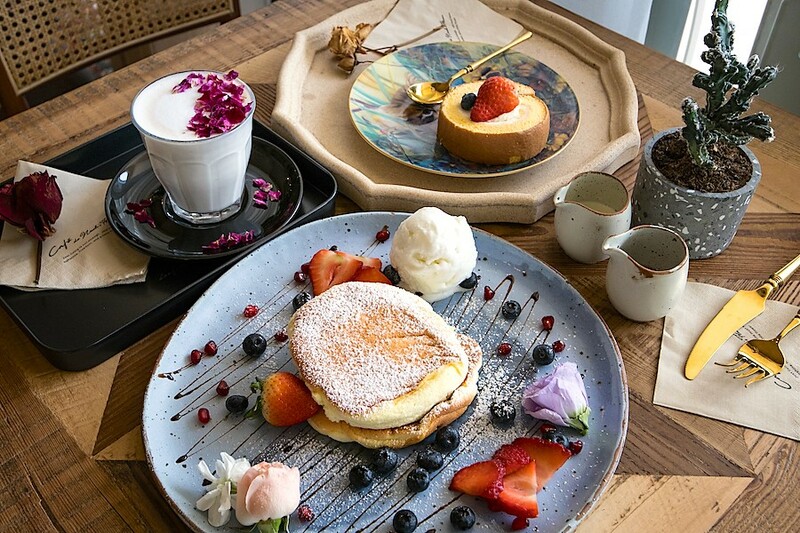 Waiting time can take up to 15 minutes to make the souffle pancakes and the service crew can be seen picking fresh flowers from the plants in their florist section to decorate the plate of dessert. 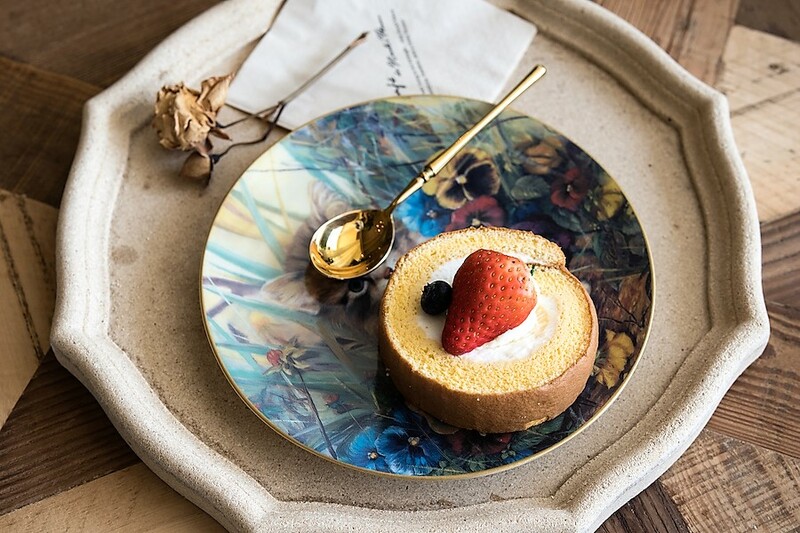 Even though the souffle pancakes may not seem as tall, wobbly or bouncy (worthy for a Boomerang shot), this plate of soufflé pancakes is a piece of art on its own, with sauces, fruits and flowers used for plating. The pancakes had a cotton-like texture and a slightly eggy taste, whereas the scoop of coconut ice cream made it more light and refreshing. I won’t recommend pouring the cups of maple syrup and fresh milk first, as there is already coconut ice cream with bits of coconut flesh which gives the dessert quite a unique flavor. 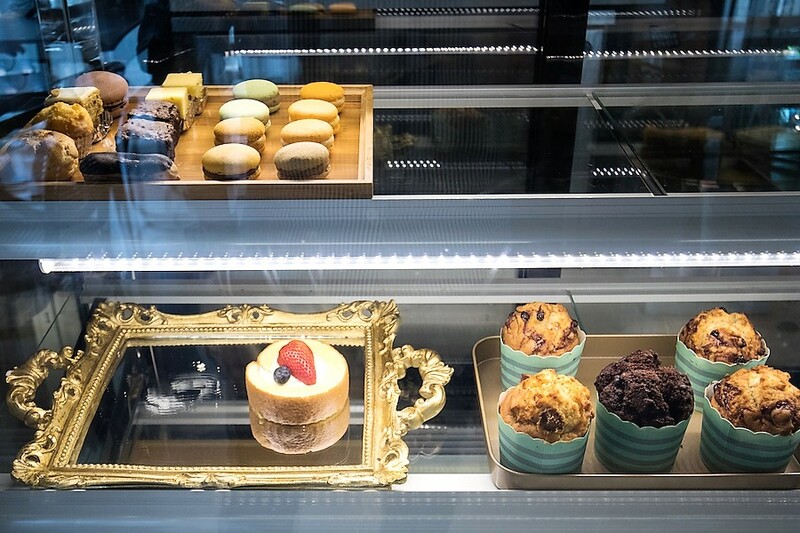 Light bites such as Swiss roll ($6.90), Muffins, Macarons, Scones and Pies are available at the counter. 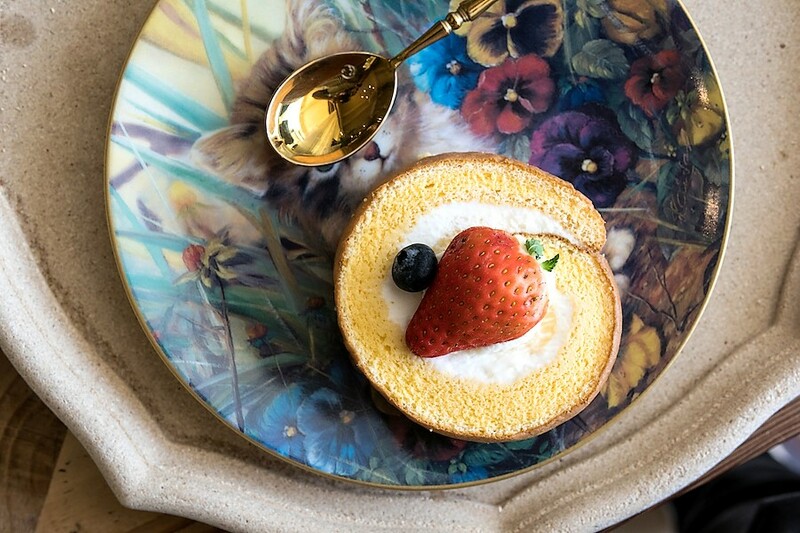 While I did not expect anything spectacular since it’s just a common of pastry, the Strawberry Swiss roll ($6.90) came as a surprise on a gorgeous plate. And again, enhanced with a piece of dried flower. 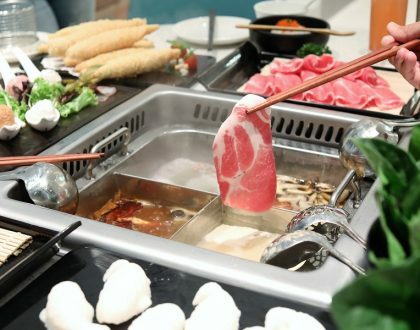 From the gold utensils to the unique tableware, the owners have put in a lot of effort to make everything looks appealing and presentable. In addition, cat lovers will be glad to know that they have a grey fur ball named “Lao Ban” aka “The Boss” in the house. 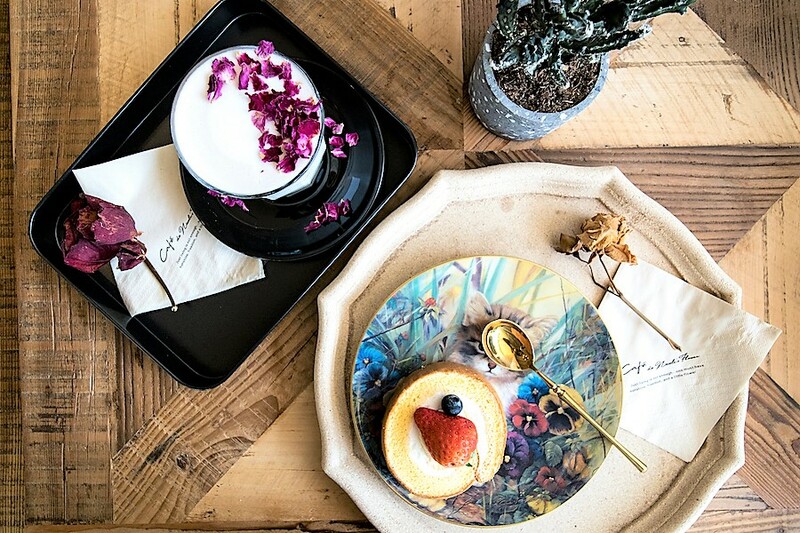 From the tiny details in their food presentation to the overall experience of the place, Cafe De Nicole’s Flower is off to a promising start.